Rapid growth in the Vietnamese market is starting to spread to secondary airports with new domestic and international routes. The new routes mark an important new phase in the development of the Vietnamese market which will accelerate as the country’s carriers pursue rapid expansion. Typically Vietnam’s secondary airports have only been linked to the three primary airports at Hanoi, Ho Chi Minh and Da Nang. Vinh will become the fifth Vietnamese airport with scheduled international services on 12-Jan-2014, when Vietnam Airlines launches services to Vientiane in Laos. In 2013 Vinh also added two new domestic routes from LCCs VietJet and Jetstar Pacific, giving the airport five domestic destinations. Vinh joins Nha Trang as a Vietnamese secondary airport with international services. Vietnam Airlines launched services from Nha Trang to Moscow in 2013, giving the airport three domestic and one international route. More international services and new domestic routes are likely as Nha Trang emerges as a popular beach destination. Nha Trang Cam Ranh Airport is currently the fourth largest airport in Vietnam based on current seat capacity while Vinh Airport is the fifth largest. Nha Trang is located in south-central Vietnam about halfway between Ho Chi Minh and Hanoi while Vinh is in the central-north, slightly more than halfway from Da Nang to Hanoi. Vinh and Nha Trang have populations of about 300,000 to 400,000 – making them about the third the size of Da Nang and approximately one twentieth of the size of Hanoi and Ho Chi Minh. The Da Nang airport handles about three times as many flights as Vinh and Nha Trang while Hanoi and Ho Chi Minh are much, much larger. Ho Chi Minh is the largest international gateway, with 36 international destinations and service from 40 foreign carriers, according to OAG data. Hanoi currently has 30 international destinations and service from 27 foreign carriers. Da Nang has a much smaller international network, with 12 international destinations and service from seven foreign carriers. But its international capacity has been rising steadily since a new international terminal opened at the end of 2011. 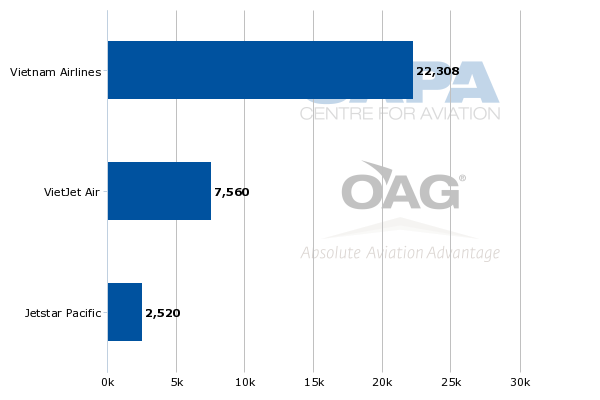 The airport currently has almost 20,000 international weekly seats compared to only a few hundred weekly seats in 2011. Over the next two to three years Nha Trang and Vinh will try to replicate this success. 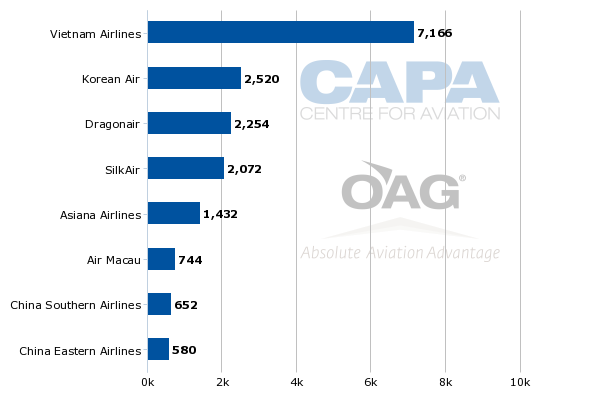 Five of the seven foreign carriers now serving Da Nang entered the market since the beginning of 2012. But Da Nang did have a setback in Jun-2013, when AirAsia dropped its Kuala Lumpur-Da Nang service after operating the route for 18 months. AirAsia was the only LCC operating international services to Da Nang or any Vietnamese airport outside Hanoi or Ho Chi Minh. Six of the seven foreign carriers now operating scheduled flights to Da Nang are North Asian full-service carriers. The only exception is Singapore Airlines regional subsidiary SilkAir, which has been serving the market for longer than any foreign carrier. Vietnam Airlines also currently links Da Nang with six destinations in China – Chengdu, Guangzhou, Hangzhou, Nanjing, Wenzhou and Xiamen (each operating twice weekly) – as well as with Macau, Seoul and Siem Reap. While China is Da Nang’s largest market, accounting for about a third of the airport’s international capacity, Seoul is by far the single largest international route. There are currently 14 weekly flights from Da Nang to Seoul Incheon, including seven from Korean Air, four from Asiana and three from Vietnam Airlines. Da Nang is a relatively small city but is the gateway to central Vietnam, offering tourist attractions away from the hustle of the big cities including pristine beaches and the UNESCO historical heritage town of Hoi An. It has emerged as a popular holiday destination for package tourists from China, Hong Kong and South Korea. As LCCs from Vietnam and North Asia expand they will likely seek to partake in the huge growth opportunities in the Da Nang-North Asia market. There are currently about 50,000 international weekly LCC seats to and from Vietnam. But all of this capacity connects Vietnam with other destinations in Southeast Asia. All six of the foreign LCCs currently serving Vietnam are based in Southeast Asia. Vietnam’s two LCCs, VietJet and Jetstar Pacific, are both evaluating opportunities in North Asia. VietJet currently has only one international destination, Bangkok, while Jetstar Pacific aims to launch international services in 2014. Vietnam is also starting to appear on the radar screen of North Asian LCCs, particularly carriers from the small but expanding LCC sectors in Korea and mainland China. North Asian LCCs could be enticed to launch services to secondary airports such as Nha Trang as North Asian full-service carriers already serve Hanoi, Ho Chi Minh and increasingly Da Nang. A package of incentives from the airport and local tourism authorities could particularly make a new route attractive. Nha Trang and other secondary airports are hoping to follow the success Da Nang has had in growing its international traffic. Nha Trang along with Vinh have been designated for international services and are in the process of being upgraded, making them potentially more attractive to international services. Nha Trang’s Cam Ranh Airport is a former military airport which opened to commercial traffic about 10 years ago and was upgraded to handle international operations about five years ago. Runway upgrades are planned along with expansion of the terminal to support up to 5.5 million annual passengers. The Vinh Airport meanwhile is now in the process of being upgraded to support a throughput of 2 million passengers per annum. While it is Vietnam’s fourth largest airport Nha Trang is currently only linked with four destinations – Da Nang, Hanoi, Ho Chi Minh and Moscow. Vietnam Airlines serves all four routes while VietJet serves Ho Chi Minh and Hanoi and Jetstar Pacific only serves Ho Chi Minh. 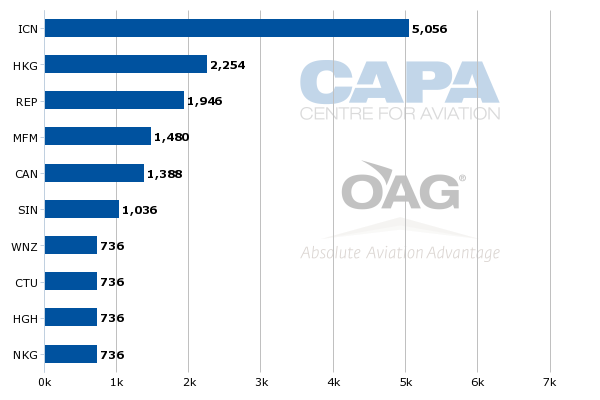 Vietnam Airlines currently accounts for 69% of seat capacity at Nha Trang compared to 23% for VietJet and 8% for Jetstar Pacific, according to CAPA and OAG data. Vietnam Airlines launched international services at Nha Trang in Apr-2013, with one weekly 777 flight to Moscow Domodedovo. The carrier added a second weekly frequency on the route at the end of Oct-2013. On days the flight is not operated, connections to Moscow are available via Ho Chi Minh or Hanoi. Vietnam Airlines has been looking at expanding its Nha Trang international operation to include other European destinations, potentially on a seasonal charter basis. London, which Vietnam Airlines already serves from Hanoi and Ho Chi Minh, is one destination reportedly being evaluated. Nha Trang’s resorts have particularly had success at attracting tourists from Eastern Europe. While Vietnam Airlines is the only carrier currently operating scheduled international flights, Nha Trang in recent months has handled Eastern European carrier charter flights from several destinations including Kiev, Nizhny, Novosibirsk, Saint Petersburg and Tomsk. Asiana also operated seasonal charter flights to Nha Trang from Seoul in 2012 and 2013. Scheduled flights to South Korea and China would be a logical target for Nha Trang given the success Da Nang has had over the past two years in attracting Chinese and Korean tourists. Both destinations offer beach resorts. China is a large and fast growing inbound tourism market for Vietnam. While LCCs from both countries have been looking at entering the Vietnam-China market, full-service carriers are well positioned to benefit from the growth as Chinese tourists typically visit Vietnam on package tours that include direct flights from their origin city. Vinh has a different passenger profile as it is more of an outbound and less of an inbound market compared to Nha Trang. The first international service for Vinh is a short flight to Vientiane in Laos. Vietnam Airlines plans to initially operate the route with four weekly ATR 72 turboprop flights starting 12-Jan-2014. The carrier says Vinh-Vientiane will give it 93 international routes, including five routes which it opened in 2013. The new route will support Vietnam Airlines’ strategy for the Mekong region, which it views as an extended home market. Vietnam Airlines is the largest foreign carrier in the neighbouring countries of Laos and Cambodia. It currently serves Vientiane from Hanoi as well as the Cambodian capital Phnom Penh. It also serves Luang Prabang in Laos from Hanoi and Siem Reap in Cambodia. Vietnam Airlines currently serves Vinh from Da Nang, Hanoi and Ho Chi Minh. The flag carrier currently accounts for about 47% of seat capacity at Vinh while VietJet accounts for 30% and Jetstar Pacific 23%. Total seat capacity at Vinh has increased by about 60% over the last year from about 18,000 weekly seats in early Jan-2013 to nearly 30,000 weekly seats currently. 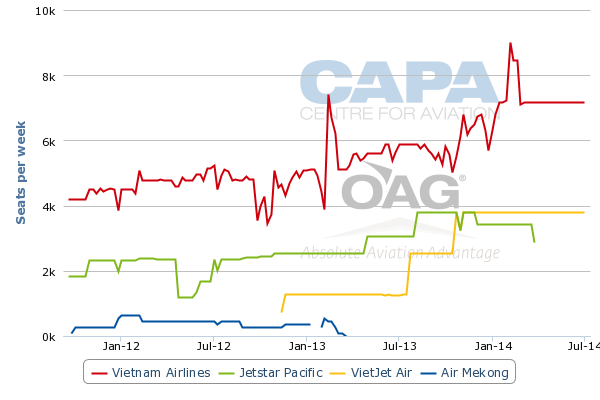 This has been driven by domestic increases by all three Vietnamese carriers. Jetstar Pacific currently serves Vinh from Ho Chi Minh and Buon Mo Thout. The Vinh-Buon Mo Thout route was launched in late Mar-2013 and is served with three weekly flights. It is Jetstar Pacific’s only route which does not touch Hanoi or Ho Chi Minh. VietJet currently serves Vinh from Ho Chi Minh and Da Lat. Vinh-Da Lat was launched on 24-Dec-2013 with three weekly flights. It is VietJet’s first route which does not touch Hanoi or Ho Chi Minh. The new Vinh to Da Lat and Buon Mo Thout routes represent a huge area of potential growth for Vietnamese secondary airports – domestic point-to-point services. Previously such travel required long bus journeys or circuitous routings via Hanoi, Ho Chi Minh or Da Nang. As Vietnam’s two LCCs expand they will look to add more such routes. Jetstar Pacific and VietJet need to diversify their domestic networks and offer more point-to-point routes as they double the size of their fleets in 2014, from five to 10 A320s for Jetstar Pacific and from 10 to 20 A320s for VietJet. Vinh will not be alone in attracting new point-to-point routes. Nha Trang and Phu Quoc are growing destinations for domestic tourists that are not yet linked to secondary cities such as Vinh, Hai Phong and Hue. Phu Quoc, which opened a new airport at the end of 2012, could also potentially attract international services in the short to medium term. Phu Quoc is a popular resort island off the southwest coast of Vietnam. Prior to the opening of the new airport, the island could only accommodate flights with regional aircraft. VietJet launched services to Phu Quoc from Ho Chi Minh at the end of 2012, just as the new airport opened, while Vietnam Airlines added capacity by up-gauging its Ho Chi Minh-Phu Quoc flights from ATR 72s to A320s. At about the same time Vietnam Airlines also launched Hanoi-Phu Quoc. Jetstar Pacific more recently responded to opportunities in the growing Phu Quoc market, launching services from Ho Chi Minh in Dec-2013. International services would be the next step for Phu Quoc. Its status as a visa free zone could help the airport and local business community, which is keen to develop Phu Quoc into a major international tourist destination, attract a foreign carrier. AirAsia is among several foreign carriers being courted. The addition of Phu Quoc would give Vietnam six international airports that are almost perfectly spread out from south to north with each airport being 300km to 500km apart. While an overwhelming majority of international traffic will continue to be funnelled through Hanoi and Ho Chi Minh, where there are plentiful domestic connections, there will be a steady increase in the number of direct international services to secondary cities. The success over the last two years of international traffic growth at Da Nang, a much smaller city than Hanoi or Ho Chi Minh, in an indication of the opportunities for some of Vietnam’s secondary airports. As a government-owned flag carrier, Vietnam Airlines will play a big role in developing international services from secondary cities. But Vietnam’s fast-expanding secondary airports should also be able to attract new services from Vietnam’s fast-growing LCCs – a mix of international routes as well as new domestic point-to-point routes. Foreign carriers from North and Southeast Asia will also start to evaluate adding secondary Vietnamese airports to complement their Ho Chi Minh, Hanoi and Da Nang services as Vietnam continues to emerge as one of Asia’s fastest growing markets.